Interested in Being a Conference Speaker? The deadline for speaker proposals has passed. We thank you for your interest in sharing your subject matter expertise to support New Jersey HR professionals. As a speaker at the Garden State Council SHRM’s Annual Conference & Expo you will experience many rewarding takeaways. Stay in-touch with your target audience and build credibility as a thought-leader in your area of expertise. Communicate proven insight and strategy through established business methods. Act as a change agent and disruptor by teaching your unique understanding and application of business theory and how, when and where to apply it. Expand your social media influence and share your speaking engagement through your website and other social media channels. Speakers are welcome to attend the conference for the entire day of their presentation including meals, snacks and receptions. We also offer a discounted rate to attend the entire conference. As an attendee, you will qualify for recertification credits through the Society for Human Resource Management (SHRM) and/or the Human Resources Certification Institute (HRCI). 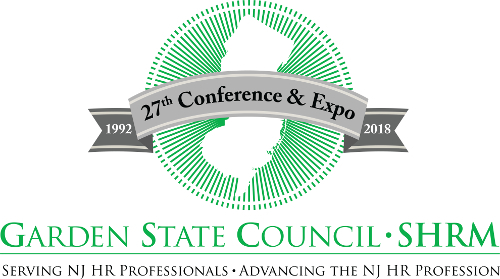 CONCERNING HONORARIA: The Garden State Council-SHRM Annual Conference & Expo has a tradition of utilizing educational conference sessions as a platform for innovation in the field of human resource management. We look for contributors who are willing to share their expertise without expectation of payment in the spirit of networking and sharing knowledge with our profession. Travel reimbursement will be made only if you travel more than 400 miles round trip from your home or office. Reimbursement will be made for applicable tolls and at the current IRS rate for mileage, and will be for all miles traveled over the 200 miles one way or 400 miles round trip. Speakers meeting the travel reimbursement guidelines are provided one complimentary night at the Sheraton, adjacent to the Convention Center. Airfare is not reimbursed. Co-presenters do not have any travel expenses reimbursed, nor are they eligible for the complimentary hotel stay.